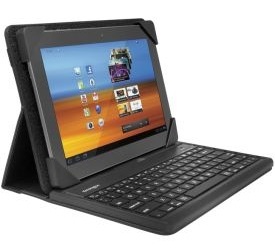 I always like to know what Kensington Technologies is up to, and I got a chance to try out their KeyFolio Pro Universal Removable Bleutooth Keyboard for ten inch tablets. After all, why should the iPad and iPad get their own Folio keyboards while there are some pretty decent 10-inch Android tablets out there. It is designed to pair with just about any Bluetooth device, really. It uses sets of StrongFit corners that can provide a custom and secure fit for large and small tablets, and they will Velcro in place. Think of it as a picture frame with adjustable edges, just designed for a tablet or phone. You have to see it to believe it. This KeyFolio Pro uses Velcro mounts with an adjustable stand for viewing angles from 70 degrees to 22 degrees. The keyboard, although small, is ergonomic and can set up on a flat surface, and can even be removed from the device entirely. Speaking of a flat surface, when the KeyFolio is folded up, it has a elasticized band to hold it together. I found that the KeyFolio Pro is very leather-y, but I am not certain what it is made of. You should be able to get it soon on the Kensington site for about $99.99.